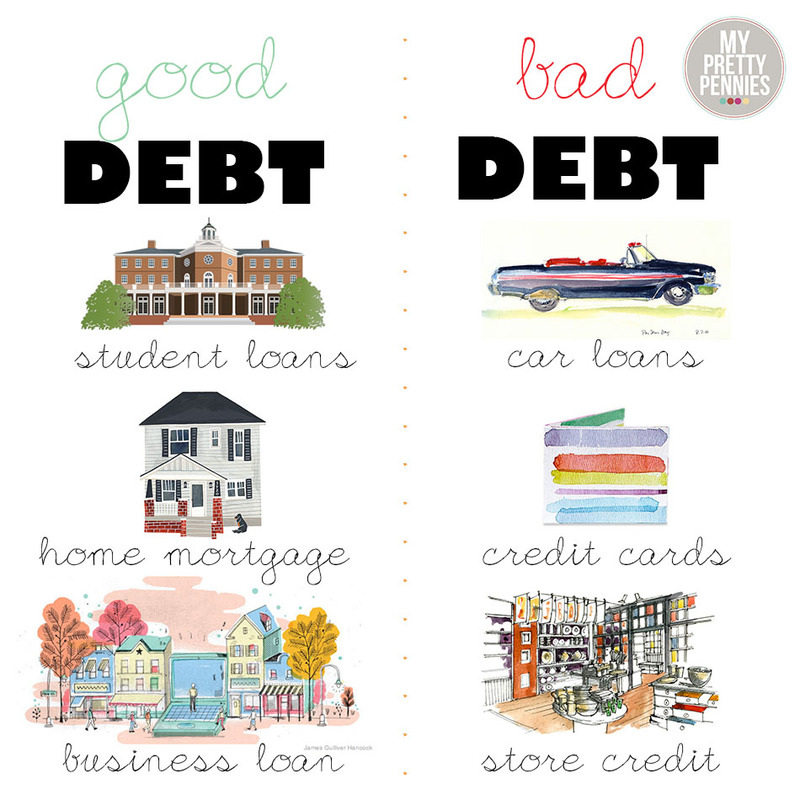 Good debt is what is helping you build your future to take from today and build a better tomorrow. Such as a home mortgage that builds equity and is a place for you and your family to live and thrive. It can also be a business loan, which allows you to build a way to provide you and your family’s future when providing jobs and a beneficial service to your community. Student loans can be good too, but be very cautious, they can’t be forgiven or used in bankruptcy and may take 30 years to pay off. They will stifle you from owning a home or building a future. Only use them if you have too when all scholarship and other means is exhausted. Pay them off as soon as you can. If you will not have the income to pay them off early, do not get them and just prolong your education. Take online and community college courses to augment your college and grad school, then graduate when you can be debt free. Bad debt is taking money away from your future that you need to live and build upon and stealing it away for pleasure or a perceived need today. Such as credit cards and a store credit shopping spree that you will be paying on for years when those goods are useless and long gone proving no useful means for you. Car loans, best not to get, only use cash and not have a loan. If you must and if you can afford it, get a reliable car that is three or four years old, after ½ the value is deprecated. Then you will save tens of thousands of dollars. Do not get a brand new car, it is bad stewardship, unless you need it for work and will have it for more than ten years. It is way better to buy a good used car (like a Honda, Toyota, Subaru or Ford, not a Chrysler or Fiat because of bad reliability or European, too much in maintenance), than new. Never lease unless your company gets a tax credit and pays for it. The math on a lease is never better than purchase. Can’t afford a three year old car? Any 4 cl Honda or Toyota that is well maintained, 94-07 is a best bet. Big Tip Credit cards. Do not get them! Second Big tip on how to pay off credit cards by making the minimum on the larger balances and pay more to the smaller balances. Then you will pay off the smallest balance first and then take those funds to pay off the next lowest balance and so forth until you are all done. The math expiates the payoff in that way faster than just a little more on each one.